Adrian reaches the end of the letter and stops, his fingers wriggling in mid-air above the keyboard. How do you end a letter to your ex-wife, he wonders. It needs to be something formal, surely. ‘Yours faithfully’ might not do, given that Emma divorced you for adultery. ‘Yours sincerely’ might be better, for a perfectly reasonable request for her to sort out some boxes of junk she forgot to take to the Outer Hebrides. And surely she must have an email address? All the Fair Isle sweater knitting co-operative, eco-friendly wind-powered craft workshop stuff seems a little contrived. Why couldn’t she have stayed in London? She can get organic food in the supermarkets. The flat in Goldstone Avenue’s cramped and untidy. There’s still a lot of Viv’s stuff that he doesn’t know what to do with. Her children are in Japan with her ex. Sorting out the probate’s a nightmare, she hadn’t made a will, they weren’t married; her decree absolute had only just come through. Whenever a letter arrives with the solicitors’ frank on it, his stomach heaves. Outside, the sky’s the yellowish-grey of a gloomy December day. Melted sleet, from the balcony of the flat above, trickles down the French doors. Emma’s wind generator must be powering half the National Grid by now, he thinks, watching a flock of pigeons whirling high above the swaying trees. Out of the cloud blanket, a plane sinks down towards Heathrow, and Adrian looks across the solar-panelled roofs of terraced houses, and the airport-blighted dual carriageways of bankrupt shops and minicab firms and self-storage units, and the pink-orange streetlights on at the wrong time of day, towards the airport, and dreams of flying. Flying, dying, like in the Robin Williams film. If I flew, he thinks, could I reach Vivienne again? He notices her desk tidy beside the computer, full of her pens and paperclips, and thinks of her long auburn hair, and the pain throbs in his chest and arms like angina. The signal goes. Adrian stares at the ‘Call ended’ words on the black screen of his phone, reflecting his face. Don’t look so scared, he thinks. Emma, arriving the next morning, doesn’t look scared. Droplets of melting snow-drizzle cling to her, and he catches a hint of woodsmoke, of log fires. She pulls a small wheelie case over the threshold. ‘I’m frozen,’ she shivers, although she’s swaddled in sweaters under the Barbour coat that she gives him to hang up. She has some wrinkles that he doesn’t remember, and a streak of white in the crown of her dark, moist hair. She’s lost weight. Perhaps living on Barra’s harder than she lets on. White, instant, no sugar, he knows. She grimaces, though, as he puts a stained mug on the worktop and switches on the kettle. She takes the mug to the sink and starts scouring it. Tutting, she empties the washing-up bowl, and starts to fill it with clean water. He stops her, ushering her away from the sink. The boxes are from the attic of their old house, and have been stacked in the corner of the living room. He hasn’t got an attic any more. ‘So, why didn’t you just throw this stuff out?’ she asks, as he puts her coffee down beside her. He doesn’t answer, and sits in the armchair, watching her lift a flap of dusty cardboard, and finding envelopes, old folders, photographs in brown paper bags from Woolworth’s. Herself as a child. There are the divorce papers of her parents. A bunch of dark, silky hair held together by a rubber band, perhaps her first haircut. Jonathan’s primary school reports. Obsolete car insurance papers, electricity bills, bank statements, payslips from twenty years ago. He lends her a crosscut shredder, and she fills bin bags with musty confetti. While she sorts through, it starts to snow. She finds Jonathan’s birth certificate. ‘He should keep this himself,’ she says. He smiles politely as she tells him that Hamish is a builder. Then her gaze drifts through the French doors. ‘That looks Christmassy.’ The tiny steel balcony’s coated in snow. The sky’s darkening and the snow’s falling in thick flakes like particles of paper, coming diagonally down the wind. It’s muted the sounds of the city. Emma turns her attention back to the boxes. ‘My life insurance policy, I haven’t seen it in years. I wondered where it was.’ Adrian gives her more coffee, heats a frozen pizza, cleans the kitchen. He scrubs the floor with Vim, wondering if it’s the right thing to use. Finally, she crams what she wants into her case. She checks her watch. ‘Where’s Jonathan got to? He’s supposed to be picking me up.’ She phones him. Her flight’s been cancelled. She calls Jonathan back, to tell him not to bother, maybe she’ll see him at Christmas, maybe in the New Year. Warmth mingles with regret in her face; she knows he wants to spend Christmas with his girlfriend, and the bump. Then she looks out at the balcony, where a white bar of snow lies on the railing. ‘I’ll see if I can get down to Gatwick on the train, see what’s going on,’ she sighs. She stays. They eat fish fingers and mushy peas in front of the TV. ‘Sorry it’s not organic,’ he says. They’re watching Top Gear, the cars hurtling around somewhere in South East Asia. As the studio guest is interviewed, Adrian stabs a fish finger with his fork and smears it in red ketchup. ‘I still can’t understand why you had to be so bloody vindictive about everything,’ he says suddenly. ‘Oh, thanks, then!’ Emma plonks her plate on the coffee table. He’s surprised to see a tear in her eye, and he gets up to draw the curtains across the French doors. Outside, the world’s freezing, and the snow’s whitening the dark air.So they drink cheap red wine, to pass the time. She’s in the armchair, he’s on the sofa, half watching the TV. It’s just like before, he thinks. Cosy and dull. ‘I’m not saying.’ Emma ends the call, and switches off the phone. Adrian remembers a time he’d been with her in the Grand Hotel at Enghien-les-Bains, standing under a luxurious shower, hair and clothes stuck to wet skin, kissing, with the water running over their faces and tongues. His eyes are drawn to her plump, red lips, and the thought of her doing it to someone else makes him furious. ‘I’ll go and make up your bed,’ he says, wrenching himself away awkwardly. Emma follows him into the bedroom. He briefly sees her reflected in the mirrored sliding door, then as he pulls sheets down from the wardrobe shelf, he remembers Vivienne’s clothes are still hanging from the rail below, and that on the dressing table, a hairbrush still holds a tangle of auburn hair. The hair that fell out while she was having chemo. He strips the old sheets and checks Emma’s expression. It’s neutral. If she’s noticed anything, she hides it. ‘I remember that duvet cover,’ she says, taking a corner to help him. ‘Hideous.’ It’s got a pink and black zig-zag pattern; they bought it for their first house. ‘We used to sleep under this,’ he says, straightening it across the bed, and patting it down. ‘Sure, thanks, Adrian.’ He finishes the wine, switches everything off,and stretches out on the sofa in his clothes. When he opens his eyes, it’s 5 am, he’s sweating, and he knows there’s no more sleep. This is the dark abyss of despair that gapes between him and the day. He gets up, and skirting the coffee table with its dirty plates, he opens the French doors. He stands on the balcony to feel his sweat freezing on his skin. 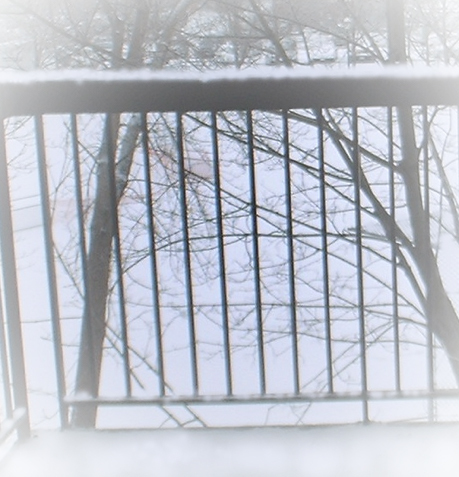 Three inches of snow has frozen on the handrail, and he sinks his fingers into it, feeling the pain of the cold searing his hands as he grips. The curtains sway back into the room and a lamp falls over. He hears the living room door open. Then Emma’s shivering at the French doors in her nightie, craning her head. The residents of Goldstone Avenue below have been enthusiastic with their Christmas trimmings. 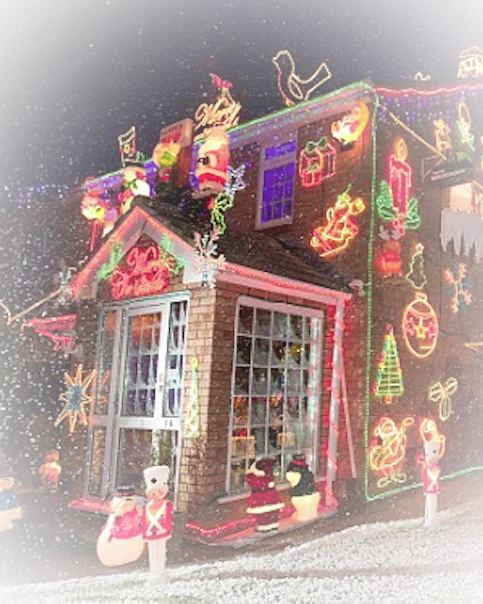 Inflatable Santas, illuminated reindeer, gutters hung with blue flashing icicles, and looping strands of multicoloured lights. The trees are glittering and twinkling with LEDs, and some sort of tinny music drifts faintly up from a loudspeaker. ‘I wish I’d got the guts to jump,’ he says. He spreads his arms wide, like the Angel of the North, and leans forward, pressing his waist into the snowy railing. ‘Or fly.’ He’s slowly tipping over, toes leaving the balcony surface. She’s beside him now, bare feet squishing into the soft snow on the balcony, her hand yanking at his collar. She looks down. ‘We’re only on the third floor. You’d probably just break a leg or something. Shall I call the ambulance first? It’ll take them ages to get here.’ The road’s mostly white, a single set of black tyre tracks wavering down the middle. ‘I can’t do it with you watching me, anyway,’ he says, wishing she’d show more concern. He shakes his head in defeat. ‘So, come back in,’ she says, teeth chattering. He sighs and they go in, wiping frozen feet on the carpet. She switches the light on. They sit down and there’s a long silence. He buries his head in his hands, propping his elbows on his knees, thinking how thin and stale he’s become. He just looks at her, pleadingly. She frowns back, her mouth compressing into a defeated expression. His heart lifts with hope, but he shakes his head. ‘The days are half as long, but twice as beautiful. You fly up there, and as soon as you land, you’ll see miles of white sand, and the sun on the sea. ‘Reflecting, in a watery mirror, a glare that is blindness in the early afternoon’. ‘No midges in the winter,’ she says firmly. Pingback: Nov 2014 CWG Critique | Aasof getting serious!